On June 10th, 2013, Oakland Police arrested a 12 year old boy for allegedly stealing a cookie from a store. According to at least one witness, officers kicked the child while restraining him. Rebecca Luisa Ruiz-Lichter was on the scene with her video camera to advocate for the child’s well being. 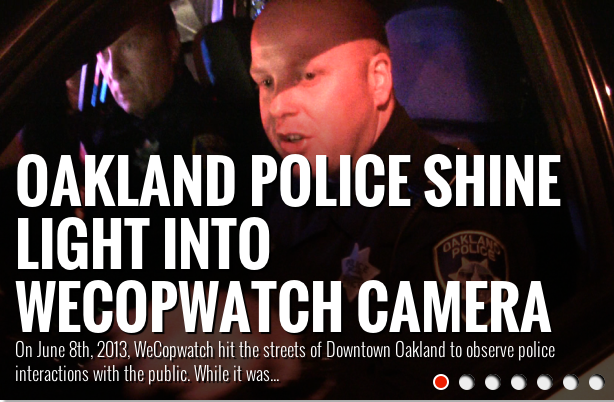 On June 7th, 2013, WeCopwatch hit the streets of Downtown Oakland to observe police interactions with the public. 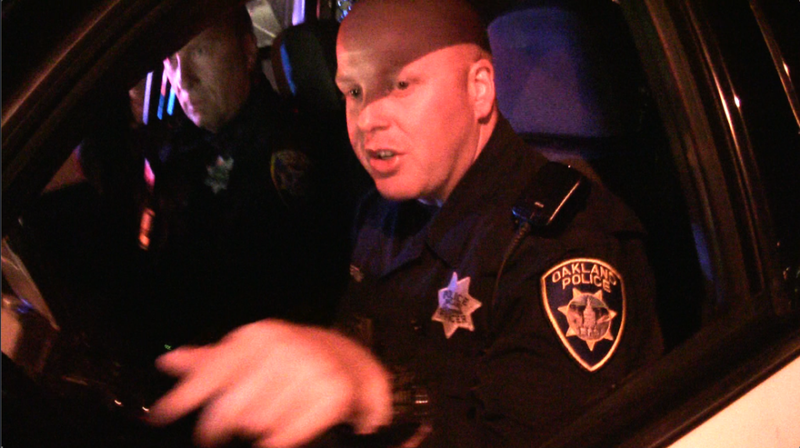 While it was a fairly mild evening it is usual for Oakland Police to shut down 1rst Friday in sections. As police attempted to move people from the West Grand and Telegraph area, one officer became aware of that he was being videotaped and shined a spot light into a WeCopwatch camera. But then he stopped, likely realizing that the interaction would probably make it to youtube by the next morning. People have the right to observe police conduct. There are no reasons to shine a light in someone’s camera in a lit area except to obstruct their ability to document. The last memorial weekend in Miami, Carlos Miller of Photography’s Not A Crime found himself in a similar experience. Following the release of this video, Miami Police Spokesperson said the actions of the officer were immature. 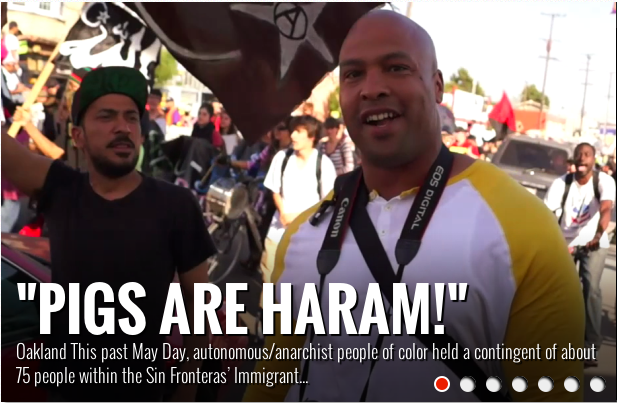 This past May Day, autonomous/anarchist people of color held a contingent of about 75 people within the Sin Fronteras’ Immigrant Solidarity march. Although the contingent had a clear non-reformist and unapologetic stance about immigration, they spent the day in solidarity with those struggling against unjust labor and immigration policies. The mood of the march was joyous and celebratory. During the march, two Muslim anarchists spotted large men who seemed out of place and were paying too much attention to the group. One cop was snapping photos of the Muslims within the contingent. Demonstrating proper Addab (Islamic etiquette), the Muslim anarchists confronted the men who were clearly undercover police, stopped them from taking photos, and with the support of the rest of the autonomous/anarchist contingent sent them on their way with chants of “Pigs Out!” and “Pigs are Haraam!” Embarrassed and exposed, the two undercover officers slipped away through the crowds watching the spectacle. Police say they tried to pull over a car and when it wouldn’t pull over, began a chase that would last over ten minutes and would end with a man shot to death by an Oakland Police Officer. Police like all people are allowed to defend themselves when they are or someone else is in danger. In this case, police say that the man was armed with a loaded handgun when he was fatally shot. Many people in Oakland carry guns, some illegally. Some argue that conditions are so bad in Oakland, that people have to take security into their own hands. Ali Winston recently reported in Getting Away With Murder that Oakland Police only solve about 25 percent of the murders that take place each year in Oakland. With those statistics in mind, WeCopwatch understands that this man may have been armed, but it still curious as to how it actually came to be that this man was shot. He was running when he was shot, that much police and witnesses agree on. But how did he pose a direct threat to officers? Even with a loaded handgun. There are no reports that the man pulled, aimed, or discharged a weapon. 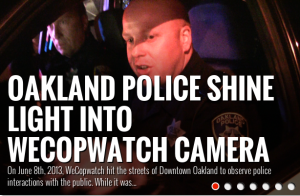 WeCopwatch asked Oakland Police’s Media Relations a few questions. . .
1. How many times was the man shot? 2. Was he shot in the front or in the back? 3. There are reports of a loaded gun being located. Was it located at Ritchie Street with the person shot? 4. Was the loaded firearm the only weapon recovered? This was the Media Relation’s response. meant to denote the immediate scene of the shooting on Ritchie. 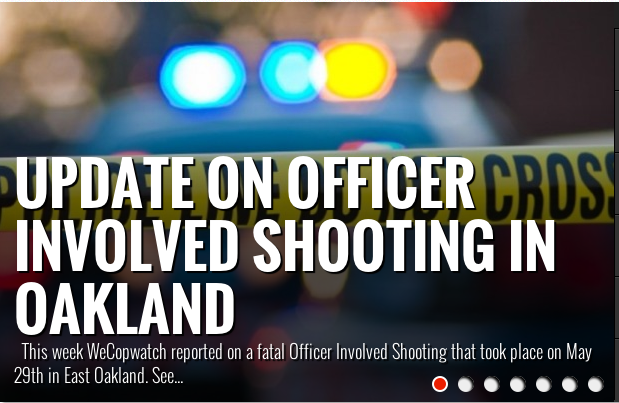 While these answers don’t reveal much as too what happened in the moments before the shooting, all responding Oakland Police Officers should have had their PDRDs (Police Data Recording Device) activated, so everything should be on video, including the actual shooting. Will documentation show that this man tried to pull out or fire a handgun at Officers? 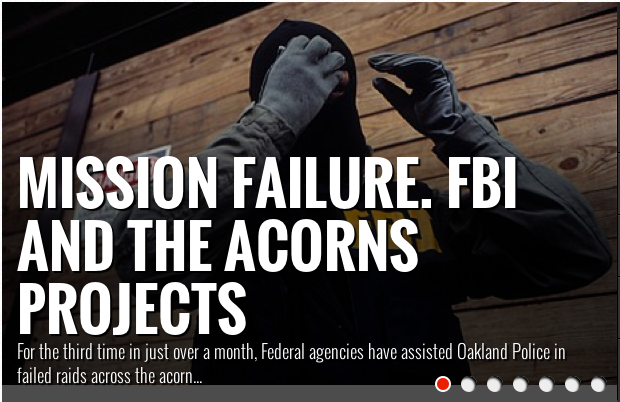 For the third time in just over a month, Federal agencies have assisted Oakland Police in failed raids across the acorn projects. At 7AM this morning around 120 Oakland Police and Federal Agents from the Secret Service, ATF, DEA, and US Marshals raided several residences in the Acorn Projects. At this point there have been no arrests. 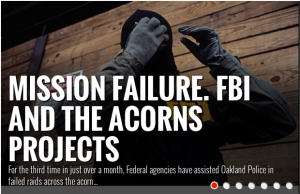 On Aril 24th, about 150 Federal Agents and about as many Oakland Police Officers conducted 16 raids in multiple cities with their primary focus, the Acorn Projects. They netted 5 arrests, a few guns and some drugs, but from all angles, it was a law enforcement failure. Then on May a more downsized unit of 40 FBI Agents, and 30 Oakland Police Officers conducted several more raids in West Oakland, yielding 3 arrests, a few guns, and some drugs. With this much effort put into one location, one could argue that the large sums of money being spent on law enforcement operations could have greater impact if it was simply given to the residents living in the Acorn Projects. On Wednesday, May 29th, 2013 at around 1:40 p.m. Oakland Police began a vehicle pursuit in East Oakland of a car containing three occupants. The chase initially began with one patrol vehicle, but over the span of the next ten minutes many more units would be deployed to create a perimeter and box the car in. At one point an Officer requested but was denied permission to use a PIT, which is a maneuver in which the police car hits the rear end of the car being chased. The impact is intended to make the driver to loose control of the vehicle. After a while, the three occupants bailed from the car. Two were detained while another person ran eastbound on Bancroft and was shot within seconds by either a chasing officer, or one that was coming to cut him off. Police say a loaded gun was recovered, but it is not clear how the man shot posed a threat to officers. From police and witness’s accounts, the man was fleeing the police. Witnesses on the scene claim the man didn’t pose a threat. One even held a sign that read. 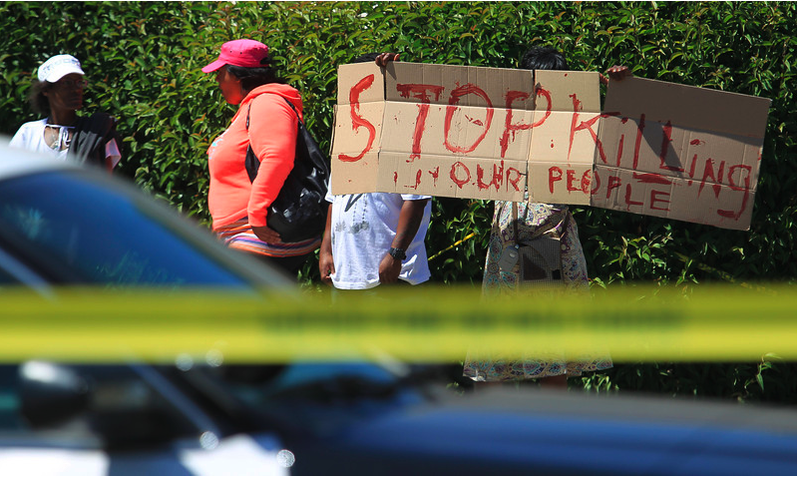 Stop killing our People. . . . The man died from his wounds. 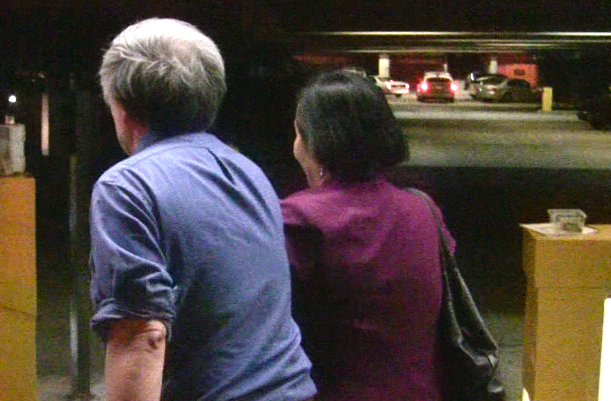 Last Week, WeCopwatch published a video surrounding an incident involving a citizen, Mayor Jean Quan, and her husband. See Video Here. Since the release of the video another person has come forward with an separate incident involving the Mayor, and her husband that took place earlier in the evening. .
Five years and seven months after Gary King Jr. was shot to death by Oakland Police Sergeant Patrick Gonzales on 54th Street and Martin Luther King Jr. Way, the Alameda County District Attorney has cleared Sgt. Gonzales of criminal misconduct in King Jr.’s death. On September 20, 2007 Gonzales mistook the 20-year-old exiting a store on the street corner for a murder-robbery suspect, and the ensuing confrontation left the young man with two gunshot wounds in his back, handcuffed, and bleeding to death. The DA’s findings puts paid to the possibility that Sgt. Gonzales could face state criminal charges for King Jr.’s shooting. Over the years, Sgt. Gonzales has become a lightning rod for critics of the troubled Oakland Police Department, which is struggling to fulfill federal reforms begun a decade ago. Since joining OPD in the late 1990s, Gonzales has featured in some of OPD’s most controversial moments, from a police assault on unarmed protesters opposing the Iraq War in 2003 and the shooting of cop-killing parolee Lovelle Mixon to the department’s violent response to Occupy Oakland. 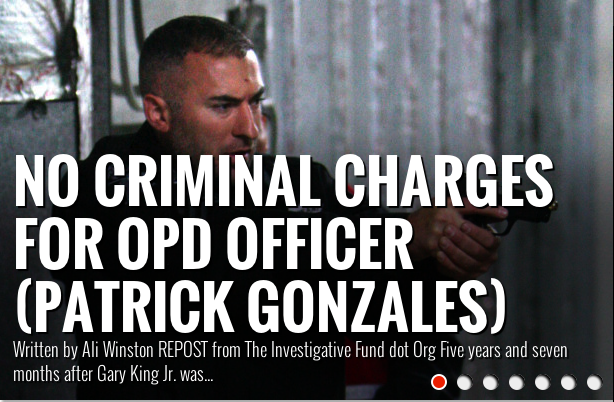 He has been involved in four officer-involved shootings over the years, and the city has paid out $3.6 million to date in legal settlements for incidents in which Gonzales played a part. The DA’s report states that at this point, King Jr. broke away from Gonzales, who drew his pistol and ordered the youth to get on the ground. The report continues: “Mr. King, still reaching for his gun, turned away from Sergeant Gonzales. He believed Mr. King posed an immediate, life-threatening danger to himself and other people in the immediate area. He fired two shots from his pistol at Mr. King from within 10 feet,” fatally wounding King Jr.
As I reported in the joint Colorlines-Investigative Fund project, “Deadly Secrets,” a revolver was found at the scene. The DA’s report states that the .32 caliber pistol was loaded, that “every detail in Sergeant Gonzales’ statement was corroborated by witnesses and by the liquor store’s video,” and that an OPD criminologist determined the revolver was in “normal working order.” However, in 2011, I reported that OPD told me that King Jr.’s revolver was broken. This was corroborated by Michael Haddad, the attorney who filed a successful $1.5 million wrongful death suit on behalf of King’s family. The liquor store video, which I reviewed, showed King Jr. fleeing towards the intersection, appearing to hold up his baggy pants by the waist. During the struggle, the DA’s report notes that King Jr. repeatedly reached for his pants, interpreting this as the youth “attempting…to get the loaded gun out of his pants.” However, no witnesses ever saw King Jr. draw the gun. In writing the King Jr. letter, Stark also reviewed Gonzales’ prior shootings: the death of Joshua Russell, a robbery suspect armed with a shotgun who Gonzales and another officer shot to death in 2002, and the non-fatal shooting of teenager Ameir Rollins in 2006 that left Rollins a quadriplegic. The DA’s report claims that Rollins pointed a rifle at Gonzales and his partner, and that Gonzales shot Rollins twice, in the arm and the neck. But rather than conducting an independent investigation, the DA’s report relied on a previously confidential police report; the DA also neglected to review medical records or interview Rollins. When I spoke with Rollins in a January 2011 interview, he told me that Gonzales fired just one shot after Rollins had dropped the rifle and raised his hands, which struck him first in the wrist and then in the neck. Rollins settled a civil rights lawsuit against Gonzales and the OPD for $100,000. A review of 22 findings letters by the Alameda DA’s office over a ten-year period indicates the King Jr. report is one of only four letters that have taken this long — more than four years — to complete. The discrepancies between the DA’s account of the Ameir Rollins shooting and Rollins’ own recollections, the reliance on OPD’s own documentation and investigation of the incident and half a decade of lag time before clearing Sgt. Gonzales all call into question the veracity of the DA’s findings letter. 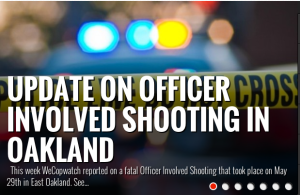 “I’m sure I had it completed beforehand,” said Stark, when asked about the lag between the original shooting and the date when his report was forwarded to OPD Police Chief Howard Jordan on April 17.